Dr Damir Esenaliev joined ISDC as a Senior Researcher in January 2019. He brings topical expertise on peace-building, social cohesion, human development, labor markets, inequality, and rural development, and regional expertise in Central Asian and transition economies. Damir also has extensive experience designing and conducting panel data collection and impact evaluations. He will continue his role as the Academic Coordinator of the Life in Kyrgyzstan Study. He has published in Journal of Comparative Economics, Economics of Transition, Social Indicators Research, and International Journal of Psychology. In addition, he has a number of working papers and reports published at DIW Berlin, IZA, University of Central Asia, and the World Bank. 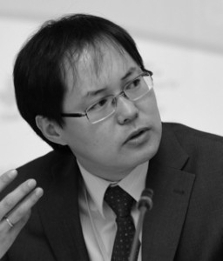 Previously, he worked at the Stockholm International Peace Research Institute (SIPRI), the German Institute for Economic Research (DIW Berlin), the World Bank office in the Kyrgyz Republic, and the National (Central) Bank of the Kyrgyz Republic. Damir holds a PhD degree in Economics from Humboldt-University of Berlin and he obtained his Master’s degree in Development Economics from Williams College (USA).